" A Snowglobe Christmas" features dozens of Austrian snowglobes like they have never been seen before. 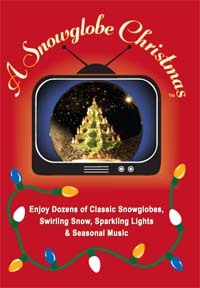 These carefully hand crafted globes are presented with special theatrical lighting and are accompanied by a variety of upbeat and jolly Christmas music. In the "Behind the Scenes" segment Mr. Erwin Perzy III explains how the snowglobe was invented. The DVD's "Director of Creation" humorously confesses to the hardships of using an international cast of snowglobe characters. Producer and Globe Wrangler Nicola Ranson offers some unique stories with these particular snowglobes. The DVD creates a warm and friendly environment to enhance family get-togethers, holiday parties, opening presents and quiet moments waiting for Santa. This product was added to our catalog on Monday 17 September, 2007.